This GoPro didn’t have much of a say in the matter. A group was watching the pride of lions at the Makanyi Lodge in Timbavati Game Reserve, South Africa, and the photographer of the group decided to put his camera near the pride to see what happened. Well, he sure got a surprise. The lions were immediately interested, and one lioness walked right up and picked it up in her mouth! The camera kept recording as she walked around the area with it in her mouth, and it got some awesome footage, as you can check out in this great video. As Massimo, the photographer, can be heard saying in the video, the pride that the group was watching consisted of 12 lions. For African lions, this is a pretty typical pride size, according to Live Science, usually with about three males and a dozen or so females, plus their young. Some prides can consist of up to 40 members. Though it turned playful pretty fast, the lions may have initially been interested in the camera as a potential threat. National Geographic explains that the male lions are primarily in charge of defending the pride’s territory, which includes chasing off animals that get too close. Once the lions saw that the camera was harmless, though, they probably just wanted to have a bit of fun! Thankfully, the camera is totally fine, and we got a great video from the lion’s perspective in the process! What did you think? Would you get that close to a pride of lions? 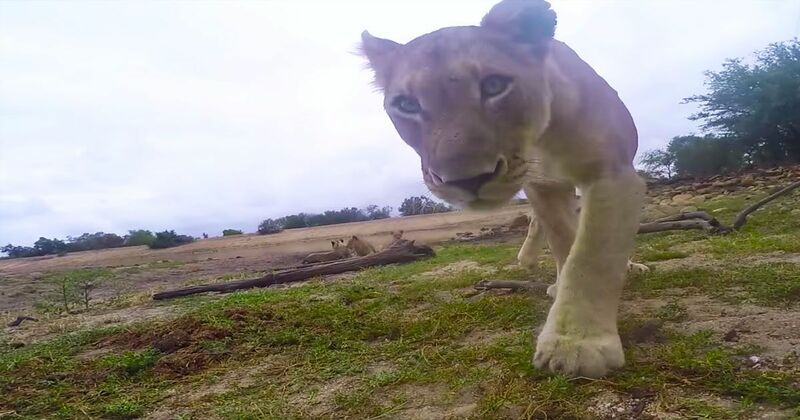 Don’t forget to share this great video with your friends and family, and let us know in the comments below if you’ve ever had any up-close lion encounters!